MediFast offers general advice and a range of low fat, low carb products to help you lose weight and feel healthier. It provides a 2 or 4 week plan, accompanied by a range of snacks, or you can simply purchase items as you need them. There are also tools for using on mobile devices, helping you to track and monitor your progress over time. 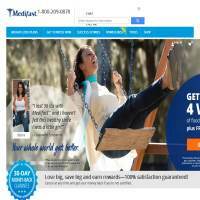 There are four key weight loss plans available through MediFast2.com. These work by varying when you eat and what you eat, whether it’s increasing snacks or making sure you go for solid meals. For example, the 3-2-1 maintenance plan allows you to eat three Medifast healthy fuelings (otherwise known as snacks), two lean and green plus meals (proteins and non-starchy vegetables) plus a balanced meal. Different systems provide different numbers of snacks, lean and green items, and balanced meals. Finding the one which suits your life style will be half the battle. If you wish to really test out the potential of the foods on sale, the 2 or 4 week plans might be useful. These provide all the snacks you’ll need to complete the full 2 or 4 weeks. Primarily, these foods are shakes and bars, so we do feel that these could get a bit boring over time. However, you can also find oatmeal, pancakes, puddings, bakes and smoothies, as well as soups. There aren’t so many savory snacks, though, although we assume that the sweeter treats aren’t actually too high in sugars. Videos around the site will instruct you on how to prepare the products. These are useful if you’re really stuck, although generally the items seem pretty self explanatory. Packages cost up to $375 and those more expensive bundles include around 175 items. Piece by piece, this isn’t too expensive, but they do add up, particularly if you’re eating several each day. The “My Wellness” section of the site is new, and offers tools for desktop computer or mobile devices. This includes a calorie counter, food checker and more. It’s good that this is provided, as some sites which sell diet products neglect the “information” side of dieting. Still, the software doesn’t look as developed as others that we’ve seen. Medifast clearly has some happy customers. We think it’ll be particularly attractive if you like sweet snacks during the day, but it might not be quite so useful for savory appetites. We recommend checking the list of products available to see if it will suit you. Prices are a little high considering it’s pretty much all just dry snacks and powdered drinks. However, there are more expensive options out there. If you like the sound of the system and the foods available, why not give MediFast a try? It’s not too expensive generally and offers a few useful tools to help you track your weight loss.